This week the National Numismatic Collection is celebrating National Coin Week with a series of blog posts and an Objects out of Storage program on April 19, 2017, from 1–3 p.m. in the museum's Wallace H. Coulter Performance Plaza. The theme of National Coin Week is Conflict and Courage: Money and the Military, commemorating the entry of the United States into World War I. Money funds militaries, of course, but money also conveys messages, which may influence and impact both allies and enemies. We've selected a few such objects that range from antiquity to World War II to share with you today. Political propaganda was integral to warfare in the ancient world. The method of mass-marketing the cool, calm, and collected rulers who came in and out of power needed to be far-reaching and overt—something akin to the modern convenience of television, radio, even billboards. The farthest reaching artifact of antiquity was coinage. Alexander the Great and his generals launched perhaps the greatest and most widespread use of coinage as propaganda. Coins of Alexander promote an image of him as a divine, beautiful, and powerful ruler. His coins don't just depict him as one divinity—sometimes he is adorned with horns as the son of the Egyptian god Ammon, sometimes he wears a lion skin denoting Hercules, and sometimes he dons an elephant headdress displaying his prowess in battle against the Persians! The daggers and spears of men are not the only concerns of soldiers. The coin sword, an art unique to south China, is believed to hold power that can drive away evil spirits. It is a charm still used by some in China, predominantly as an element of feng shui. Coin swords are made by fashioning threaded coins around one or two iron rods. Traditionally, the coins used in a sword's construction must all be from a single emperor's reign, and the cord or wire which binds them together must be red. It takes at least 100 cash coins to create these swords, as they span about two feet in length. 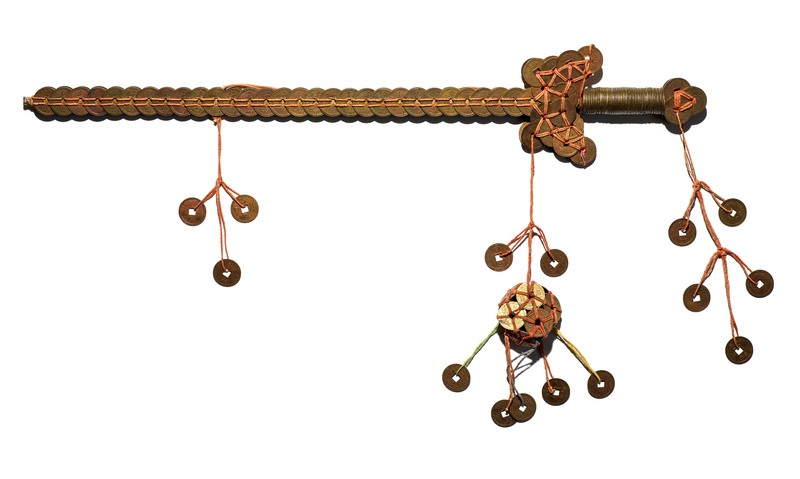 These swords are hung on the walls of houses as a warning to evil spirits. The older the coins, the more effective the sword! Many pieces of currency produced during the Revolutionary War era contained both hidden and explicit messages. Because there was no centralized government or national mint at this time, the currency produced was designed by Revolutionary leaders, such as Paul Revere, John Adams, and Benjamin Franklin. These notable figures could select any imagery they desired, which would then be circulated throughout the colony in which it was produced and beyond. One of the earliest attempts to sway public sentiment through currency is shown in the "Sword in Hand" five shilling note, printed in Massachusetts in 1775 and designed by Paul Revere. During the Civil War, many denominations of gold coins disappeared from the economic market as individuals began hoarding them for their metallic value. In the North, people attempted to circulate postage stamps with a set value to remedy this shortage. Paper stamps, however, were not durable enough for mass circulation. In 1862 an American inventor, John Gault, suggested the stamps be encased in a brass holder that had a clear screen made from mica so the stamp could be easily seen. Oftentimes, merchants would engrave an advertisement for their establishment on the reverse in the hopes it would circulate and promote their business. Like the current United States penny, these encased postage stamps cost more to produce than they were worth! Due to the high cost of production, this form of currency was abandoned. During World War I, many soldiers were taken as prisoners of war (POWs) and put to work in camps. The Hague Conventions of 1899 and 1907 required signatories to provide humane treatment of POWs. In many POW camps, it was reported that only officers were treated appropriately. Non-officers in some camps were forced to work and were paid with camp coupons like the 50 centimes coupon above. These coupons and currencies were issued by the military for use specifically within the camps, meaning they were otherwise worthless! After the attack on Pearl Harbor in 1941, Americans feared a Japanese invasion of Hawaii. The federal government worried that if an invasion were to happen, it would give the Japanese access to all of the money circulating in Hawaii. To prevent American money falling into Japanese hands in Hawaii as a result of an invasion, the United States recalled almost all of the currency in Hawaii and issued new bills. The new bills featured the word "HAWAII" printed twice on the obverse and once, very large, over the reverse of the note. If Japan did invade Hawaii, the United States could demonetize all notes with the Hawaii overprint, rendering them completely worthless. At the end of the war, the Hawaii overprint notes were recalled and most were destroyed. Some notes avoided destruction and have become part of historic numismatic collections. We encourage you to visit us on April 19, 2017, from 1–3 p.m. in the Coulter Performance Plaza to see these and many more examples of money relating to military topics. Hillery York, Jennifer Gloede, and Emily Pearce Seigerman are collections staff in the National Numismatic Collection.